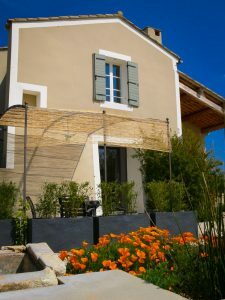 Domaine l’Ancienne École is in the North Eastern corner of Provence nestled up against the foot hills of the Alps and with panoramic views of the Mont Ventoux. It is the perfect base for many activities, such as cycling, walking, wine tours, sightseeing or just chilling by the pool. We have three recently renovated gites; Les Marronniers has three bedrooms and can accommodate six people, Le Mont Ventoux has two bedrooms for a family of four and Les Pré-Alpes which has one bedroom and can accommodate two people, all three gîtes have shared use of our large infinity pool with views over the vines and beyond to the Mont Ventoux. Children are very welcome. 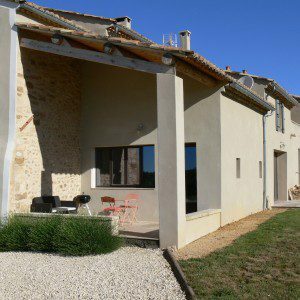 Les Marronniers and Le Mont Ventoux are perfect for families. We are able to provide a high chair, travel cot and many of the other items which make life with young children easier. There is also lots of space outside for children to run around and let off steam whilst you relax with a glass of perfectly chilled rosé. You can see more details by looking at our advert on Home Away Holiday Rentals: See our gites reference 806021 on HomeAway Holiday-Rentals. You can check availability for the 3 bedroom Les Marronniers here: See Les Marronniers availability, for the 2 bedroom Le Mont Ventoux here and for the 1 bedroom Les Pré-Alpes here: See Les Pré-Alpes availability.